Last week we made a significant transition in our sermon series. Starting back in the fall, we’ve explored the big storyline of the Bible, and then seen how Jesus is the main character of that story. And now, we’re turning to see what our place in this story is. We began by looking at 2 Corinthians 5:17, which says that if anyone is in Christ, they are a new creation. Another way of putting that is to say they are a part of the New Creation. Eternal life has already begun. That much is already true of us. But we also saw that there’s so much that’s not yet true of us. Our bodies are still a part of this old creation, and we still struggle with sin and suffering and death. And yet we saw that the arrival of the New Creation has changed so much for us. Even though sin and suffering and death are still around, our relationship with them has been totally changed in this time of already-but-not-yet. The arrival of the New Creation in our inner self allows us to fight sin and rejoice in suffering and even count death as gain. And that’s really what this next leg of our series is about: what does all of this mean for you and I today? And we’re going to get specific. Next week’s series is about work. Like, our jobs and our work at home and in the church. The week after that we’re talking about money and then marriage and then singleness. That level of specificity. But before we get into those specifics, before we’re really free to talk about our place in the story, there’s one more stop we need to make. And that’s where we are today, talking about the people of God. Here’s where this topic comes from: as we’ve surveyed the big story of the Bible, it’s hard to miss that this big story, from Abraham onwards, has largely been about an ethnic people group. The people of Israel. I can speak for myself here: I’m not Jewish. Which means I’m a Gentile. And statistically, many of you are in the same spot. So how does that work? Was it ok for us this morning to sing “By faith our fathers roamed the earth”? Really? Our fathers? Are we allowed to say that? Are we sure we fit into this story? These are important questions for us to ask before we go any further. As we begin to try to answer these questions, I hope you’ll remember that from the beginning of the story, God was concerned for the nations. When He chose Abraham, He promised him that in his offspring all the nations of the earth would be blessed (Genesis 22:18). Reaching the Gentiles was always a part of the plan. And that was central to Israel’s calling. They were to be a kingdom of priests (Exodus 19:6) and were to declare His glory among the nations (Psalm 96:3). But by and large, they didn’t. They abandoned the Lord to serve the gods of the nations. When they were finally taken into exile, they profaned God’s name among the nations, as Ezekiel 36:21 says. And after the exile, their went way in the other direction and completely isolated themselves from the nations, so that by the time of the New Testament, most of the Jews wouldn’t even associate, visit (Acts 10:28) or eat (Galatians 2:12) with those who were not Jews. They insultingly referred to the Gentiles as “the uncircumcision” and had as little to do with them as possible. Hardly the posture of blessing. “Alienated from the commonwealth of Israel.” We were foreigners to the people of God. Another word we could use for “commonwealth” here is “citizenship.” We had no citizenship in God’s kingdom. We didn’t belong. “Strangers to the covenants of promise.” We were outside of these incredible covenants God made with His people. We knew nothing about them and were not being touched by them. “Having no hope.” Without the promise of a Messiah, without the promise of the covenants, what hope is there? None. “Without God in the world”. This is the summary of it all. We were without any knowledge or relationship with our Creator. This is a pretty bleak picture, isn’t it? But against this blackness, listen to how verse 13 shines out: “But now in Christ Jesus you who once were far off have been brought near by the blood of Christ” (Ephesians 2:13). In Christ, and by His blood, the door has been opened, and you and I have been welcomed in off the street and given a seat at the table. Our state is totally opposite of what it was. From far to near. So how did this happen? How did Christ bring us near? Let’s start to untangle this by looking at that last phrase there—the “dividing wall of hostility.” This is very likely a reference to a low wall that surrounded the courtyard of the Jerusalem temple. Outside of that wall, Gentiles were permitted to come and see the temple from a ways off. But you could only pass inside and draw near to the temple itself if you were a Jew. There was actually an inscription on this wall that warned Gentiles that they would be responsible for their own death if they went inside. How’s that for a welcome sign? Can you imagine standing there, looking in, knowing you’ll never be allowed to simply because you were born into the wrong family? But through Christ, that dividing wall of hostility between Jews and Gentiles is broken down. Jesus broke it down in his flesh, which speaks of His death on the cross. He paid for our sins once and for all, and completely fulfilled the whole system of rituals and regulations that had kept us out. That is strong language, and we’re going to come back to this verse in a few weeks when we talk about the law. But for now, I just want us to appreciate that Jesus abolished that whole system by paying for our sins once and for all and making us perfectly righteous in Him. And so there’s nothing left to keep us Gentiles outside, cut off from God’s presence. The wall is knocked down and we’re welcomed inside. Do you hear what’s going on here? Paul is telling us that this whole Jew/Gentile divide is a thing of the past. There’s not these two groups of people anymore. In place of them, Jesus has created one new man. When you hear that phrase “one new man,” does it ring a bell at all? Does it sound a little bit like the “new creation” from last week’s passage? Scholars recognize that this is the same idea. This is talking about the New Creation humanity which Jesus has created. We saw earlier this fall how Jesus is the Last Adam, the Father of the New Humanity. Maybe you wondered what that meant. This is what it meant. The New Humanity, or this “one new man,” is simply all those who have become a New Creation in Christ. And it includes everyone—Jew or Gentile—who has been reconciled to God through the cross of Jesus Christ. In other words, it doesn’t matter if you’re a circumcised Jew or an uncircumcised Gentile. What matters is being a new creation. Being a part of this New Humanity that Jesus has created. Remember verse 12? How we were separated, alienated, strangers, and without God? And now, the opposite is true. Us Gentiles, through faith in Jesus, are in all the way. We’ve been given full citizenship in the kingdom of God. We’ve been fully adopted into the family. We are full members of the people of God. Now what we’re going to do next this morning, as we try to really wrap our heads and our hearts around this truth, is to see how this passage and this truth can help correct some unbalanced ideas that we sometimes encounter regarding the relationship between Jews and Gentiles in the people of God, in the New Covenant. So, let’s talk about one of those imbalanced ideas which you may have heard about. It’s called “replacement theology.” Now I’ve never actually met anyone who has held to this, but from what I gather, the idea that God is totally finished with the Jewish people. And on the day of Pentecost, God created the church as a replacement for Israel. That’s where the name “replacement theology” comes from. The church has replaced Israel as the people of God. Now on the other end of the spectrum, there’s another imbalanced way of thinking about Israel and the church, and in my experience it’s a bit more common than the first. This idea still says that the Gentile Church and Israel are two completely different groups, but the difference is that it says they’re both God’s people. In other words, there’s not one people of God, there’s two peoples of God: Israel, and the church. And extreme forms of this teaching say that Israel and the Church relate to God in different ways, are a part of different covenants, have different futures, and even have different eternal homes. The Gentile Church will spend our eternity in heaven, and Israel will get the New Earth down here. Now maybe you haven’t taken things that far, but it’s possible that you’ve been impacted by this teaching that “Israel” and “the Church” are two different peoples of God. It’s been very popular here in North America for the past 150 years or so. All I would ask you this morning is to consider whether or not this idea really holds up against everything that the Scriptures tell us, especially in our passages today. Do all these statements about making us one, creating one new man in place of the two, causing us Gentiles to be fellow citizens with the saints—do they really fit with the idea that there’s two different agendas, two different futures, two different peoples of God? Or just think about this teaching in the light of the second passage we read from Galatians: “There is neither Jew nor Greek, there is neither slave nor free, there is no male and female, for you are all one in Christ Jesus. And if you are Christ’s, then you are Abraham’s offspring, heirs according to promise” (Galatians 3:28-29). According to Galatians 3:29, who are the true sons of Abraham? It’s those who have faith in Christ, whether they are Jew or Gentile. Or think of what Jesus said when he met the very Gentile Roman Centurion, he said “Truly, I tell you, with no one in Israel have I found such faith. I tell you, many will come from east and west [that’s from the gentile nations] and recline at table with Abraham, Isaac, and Jacob in the kingdom of heaven, while the sons of the kingdom will be thrown into the outer darkness. In that place there will be weeping and gnashing of teeth” (Matthew 8:10-12). We could go a lot of different places and see the same thing: what matters is not our ethnicity but our faith in Christ. And so once again I’d just ask us to consider this view which says that God has two different people—the Gentile church and the Jewish people—and ask if it’s really Biblical. Because it sounds to me like all these Scriptures are saying that God only has one people, made up of all Jews and Gentiles who believe in Jesus and draw near to God through Him. Now, with all of that being said, we need to clarify something important. When the Scripture teach that Jewish and Gentile believers are all one in Christ, we shouldn’t take that to mean that being a Jew or a Gentile means nothing at all. It doesn’t mean that when a Jewish person believes in Jesus as their Messiah, their Jewishness just gets erased. When it says that there’s no male or female, does that mean that our gender differences don’t matter? That when we believe in Jesus, our gender gets erased and there’s no difference at all between being a man or a woman? Of course not! We see many times in the New Testament that we are still men and women, and our genders matter. We even have different roles to play in the home and in the church. But what Galatians 3:28 is saying is that both men and women are an equal part of the one people of God, and we approach God on the same level ground of the cross. Being a man or a woman doesn’t make you any more or less closer to God, and being a man or a woman doesn’t make you any more or less a part of the people of God. And so it is with Jews and Gentiles. We read in the New Testament that when Jewish people became believers in Christ, they didn’t stop being Jews. They didn’t have to erase or forget about that part of themselves. The Jewish part of the story still means something important. One way we see that is by looking to the end of the story, in the book of Revelation, and noticing how our eternity is going to have a very Jewish flavour to it. The capital city of the New Earth will not be New York but rather the New Jerusalem. And as we walk into the New Jerusalem we’ll be passing through gates which are named after the twelve tribes of Israel (Revelation 21:9-14). And that’s kind of the point. What Paul is describing here in Ephesians 2 is not a replacement of Jews with Gentiles or an erasure of the Jewishness of this story. Instead, he’s saying that we Gentile believers have been welcomed into this one people of God, with all of it’s rich Jewish heritage. And there’s one more piece to all of this, which we find in Romans chapter 11. In that chapter, Paul compares the people of God to a tree, and he says that some branches have been broken off of that tree because of their unbelief in Jesus. In other words, they are no longer a part of the people of God. On the other hand, some other branches—us Gentiles—have been grafted in to that tree and now are a part of the people of God. “And even they, if they do not continue in their unbelief, will be grafted in, for God has the power to graft them in again. For if you were cut from what is by nature a wild olive tree, and grafted, contrary to nature, into a cultivated olive tree, how much more will these, the natural branches, be grafted back into their own olive tree.” (Romans 11:23–24). So it’s not like those branches that have been broken off don’t mean anything at all. He has hope that if they turn from their unbelief, they will be grafted in again to the people of God. And as Paul goes on, it seems like he does expect a time in the future when many of these broken branches will be grafted in again. He says this in verse 25: “Lest you be wise in your own sight, I do not want you to be unaware of this mystery, brothers: a partial hardening has come upon Israel, until the fullness of the Gentiles has come in. And in this way all Israel will be saved” (Romans 11:25–26). And when we piece that together with the rest of the chapter, the idea that seems to emerge is that before Christ returns, a large number of the Jewish people will place their faith in Jesus and be grafted in to this tree again, this one tree of the people of God. You may or may not recognize it, but that’s some pretty intense theology we’ve just covered. And maybe in what I’ve just said has raised some questions for you. Maybe you’re wondering how this fits with things that you believe or things you’ve heard other people teach. And I would love to have a conversation with you about that. Send me an email or a text, and come talk. I’d thoroughly enjoy that. As we prepare to wrap things up this morning, I want to ask a simple question: why does this matter? Why are we talking about all this today? The first one, as I mentioned at the beginning, is that before we went any further, we had to clarify that that this story is our story. The Jewish Scriptures are our Scriptures. These covenants are our covenants. 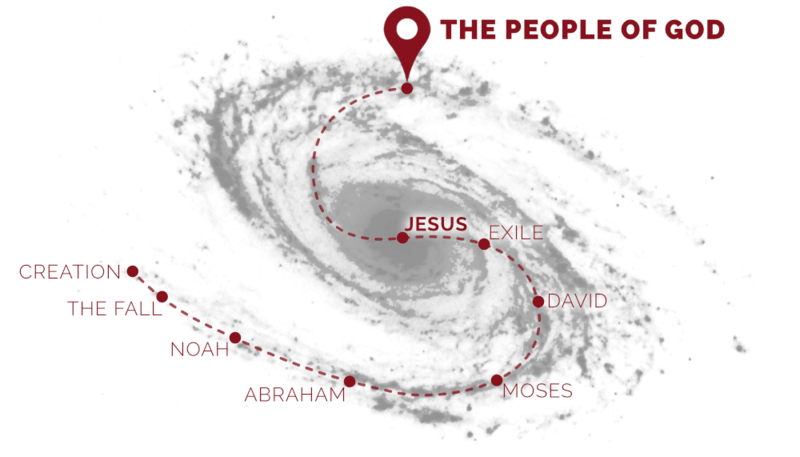 As Gentile believers in Jesus the Messiah, we really have been made a part of this story. Second, as we understand our part in all of this, and how we’ve been brought into something that’s been going on for so long, it should cause us to have humility. That’s what Romans 11 talks about. After this discussion of the olive tree, Paul writes “Do not be arrogant towards the branches… So do not become proud, but fear” (Romans 11:18, 20). We’ve been invited to join something very old and very precious, and not because we are special. Only because of Jesus. We were outsiders who have been made insiders because someone else died for us. And so we should feel very humbled by this. There should be no swagger in the Christian life. No pride. We should be people marked by thankfulness and humility. Third, it’s important for us to think about ourselves as a part of a people, because it reminds us that being a New Creation in Christ is not a solo mission. It’s not just “Jesus and me.” Instead, it’s Jesus and us. We’re a part of a people, a new humanity who will inhabit the New Heavens and the New Earth forever. And there’s a lot of practical implications that come from thinking about ourselves this way. For example, look around you for a moment. These are the people that you get to live forever with. And if eternal life has already begun, like we heard last week, then these are the people that you have already started to live forever with. Do we live like that? Do we live like we’re a part of the people of God, a fellow citizen of the New Earth? Do we live like we’re in this together and that we’ve already begun to spend eternity together? “Do not lie to one another, seeing that you have put off the old self with its practices and have put on the new self, which is being renewed in knowledge after the image of its creator. Here there is not Greek and Jew, circumcised and uncircumcised, barbarian, Scythian, slave, free; but Christ is all, and in all. Put on then, as God’s chosen ones, holy and beloved, compassionate hearts, kindness, humility, meekness, and patience, bearing with one another and, if one has a complaint against another, forgiving each other; as the Lord has forgiven you, so you also must forgive. And above all these put on love, which binds everything together in perfect harmony. And let the peace of Christ rule in your hearts, to which indeed you were called in one body. And be thankful.” (Colossians 3:9–15). We’re going to close here by standing and singing together again that Abraham, Isaac and Jacob are our fathers through faith in Christ. That in Christ, we are Abraham’s offspring and children of the promise. And just like our fathers, we’re going to walk this stretch of our earthly journey together, by faith, looking ahead to all that’s in store. 1. A. Skevington Wood, “Ephesians,” in The Expositor’s Bible Commentary: Ephesians through Philemon, ed. Frank E. Gaebelein, vol. 11 (Grand Rapids, MI: Zondervan Publishing House, 1981), 39.